I hate to admit it but I can't survive a week without chicken, I love chicken as much as my kids do so I make sure that I always make a special chicken recipe for them especially on weekends. I know a lot of chicken recipes but this one is something new for me. I have watched a lot of videos about this recipe and this is my first time to actually do it for my family. This recipe does not require too many ingredients as it only contains three main ingredients: chicken breast, ham, and cheddar cheese plus condiments to add flavor. 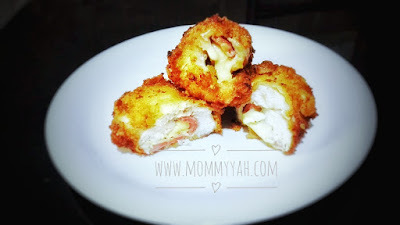 this recipe is called Chicken Ham rolls with Cheese. This recipe will only cost about 150 pesos and it can make 5 servings.